Must have GIZMOS: Panasonic's new Lumix cameras with Mega O.I.S. Panasonic's new Lumix cameras with Mega O.I.S. Panasonic are adding to their Lumix range with three new models - the DMC-LZ5, LZ3 and the LZ2. Probably the most noteable feature is Panasonic's Mega O.I.S. (Optical Image Stabilizer), which detects and compensates for any hand shaking when taking your snap. And you get it on all three new models, not just the top end LZ5. 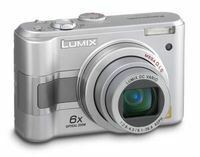 The Lumix DMC-LZ5 (pictured) is a 6 megapixel camera with a 6x optical zoom, 2.5-inch LCD, four scene modes and a maximum ISO setting of 1600. The LZ3 is a 5 megapixel camera, with a similar, but slightly lower spec overall. The LS2 is also a 5 megapixel camera, but features 3x optical zoom and a 2 inch display. All three models will go on sale in March. Prices have yet to be finalised by Panasonic.